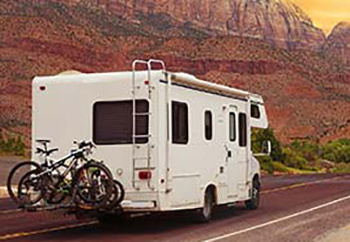 An extended RV warranty from RVing Solutions will help keep your RV on the road longer and reduce maintenance and repair costs. Unlike your home, your RV has a drive train and other mechanical equipment that can require repair. And, just about any repair, whether it’s a refrigerator or a radiator, can be very expensive. That’s why RVing Solutions offers the most comprehensive warranty in the RV business. New or used, with an RV plan from RVing Solutions, you are covered from the microwave oven to the satellite dish; the engine to the garbage disposal. By your 8th year of ownership–or the 8th year that the vehicle has been on the road–a mechanical breakdown is all but guaranteed. 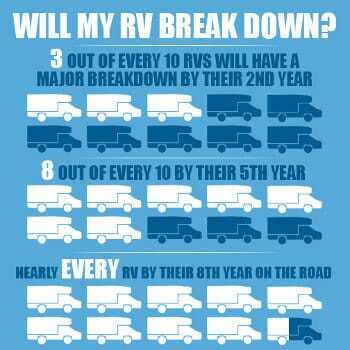 Even just in their 2nd year in service, 3 out of every 10 RV’s will breakdown. With mechanical repair costs ranging from just a few hundred to thousands of dollars, the risk is always present. You didn’t purchase your vehicle to have it sit in your driveway or at a storage lot awaiting a time when you can afford to pay for repairs to be done–and you won’t have to with an RV Extended Warranty. You didn’t purchase your vehicle to have it sit in your driveway or at a storage lot awaiting a time when you can afford to pay for repairs to be done–and you won’t have to with an RV Extended Warranty. Keep in mind that one of our highly trained motor-home warranty specialists or travel trailer warranty specialists would be happy to do the research for you! The program includes pick-up and delivery reimbursement. 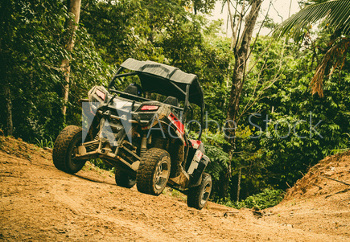 On-road vehicles also receive the following benefits with the program: rental vehicle reimbursement, meals and lodging reimbursement and emergency roadside assistance.